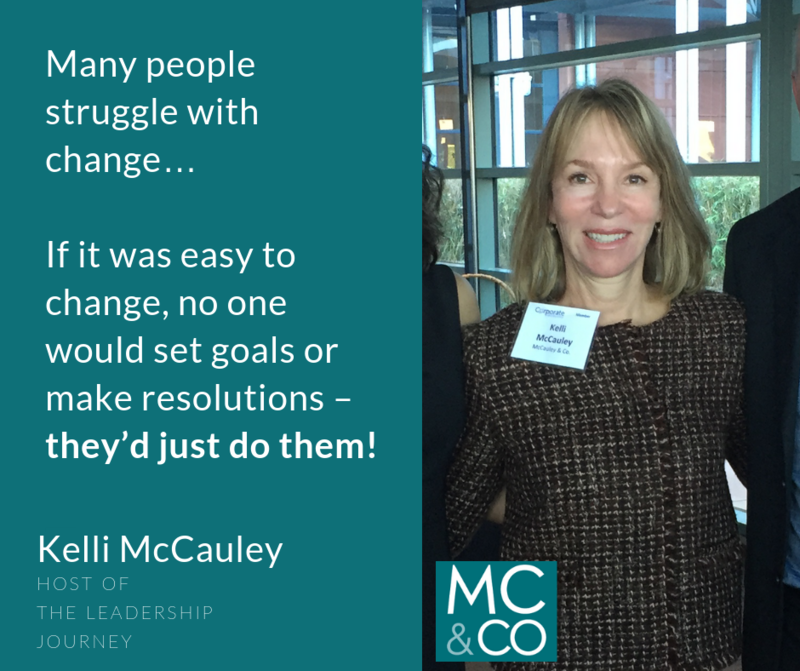 McCauley & Co.Outsmart Your Brain to Accomplish Your Goals - McCauley & Co. According to current research, at best only 30% of Corporate Change Initiatives succeed. You’ve seen the stats… 80% of people quit their New Year’s resolutions by the 2nd week of February. Here’s what I use with my clients to stack the odds in their favor to achieve their goals and accomplish lasting change both personally & professionally. These four practices are proven ways to outsmart your brain’s resistance to change the important things in your world that YOU want to impact. Many people struggle with change…if it was easy to change, no one would set goals or make resolutions – they’d just do them! Take note, your personal world, very much like your professional world is set up to keep you exactly the same as you were yesterday. Your team doesn’t like it when you change and are hoping it’s just a phase that you’ll abandon after a few weeks. Surprisingly and disappointingly, family, friends, or significant others can get threatened when you announce a plan to improve yourself. Because what you’re looking to improve upon takes extra effort, you want a plan to keep you successful when you’re tempted to slip into old habits. When I run my Blueprint for High Performing Leaders program, it involves Emotional Intelligence and Leadership Styles feedback, intense reflection on how they are being received as leaders, and they create a specific plan to become more effective as a leader. I warn them “When you go back to your organization, everything is set up for you to be exactly the way you were before you came to this program.” You must steel yourself from falling back on old habits that aren’t working and here’s how. 1. What did you do that you promised to do? 2. What didn’t you do that you promised to do? 3. What will you do to make progress on your goals by the next time we speak? I work with top leaders and their teams within Financial Services who are overseeing billions in assets. I also work with Key Partners in top Law Firms. These clients are brilliant, very accomplished and intense… which requires me to always be mentally sharp and on my A game! How do I support my mental and physical goals? Frankly, I’m not disciplined enough to work out regularly, so I hire a personal trainer to be sure I won’t skip out on the workouts. I’ll flake on a workout on my own calendar, but won’t dare miss a scheduled appointment with a trainer. Knowing that bad food choices happen when you’re hungry or dehydrated, I keep water bottles and healthy snacks, like high protein RX bars (try their chocolate and sea salt bar) in my car, purse and travel bag. We also plan ‘fast to table’ meals during our week – every parent listening has this type of after-work calendar – carpooling to basketball practices, tutors, hip hop dance & gymnastics, etc – these meals have to be easy and fast to prepare and include healthy proteins & veggies. To achieve your best version of yourself, your environment must reinforce and bring out the ideal YOU, every day. Whether professional or personal, you want to have Goal Guard Rails to keep you on your success path. Knowing this and to help you win, we’ve created a simple to use the worksheet that will keep you on track. Sign up below to get the ‘Goal Guard Rails’ worksheet. It includes a place to write your Goals, the specific actions needed to achieve them, your deadlines, plus a spot to name your success partner! If you’re serious about achieving your best version of yourself, whether personal or professional, The Goal Guard Rails worksheet will keep you focused on the activities, habits and people who will keep you on your road to success. Just know that you’re in good company when you determine to make a change and it gets hard. Put in place the Guard Rails you need in order to achieve your goals and you will hit way more than you miss! Download the Goal Guard Rails Worksheet!